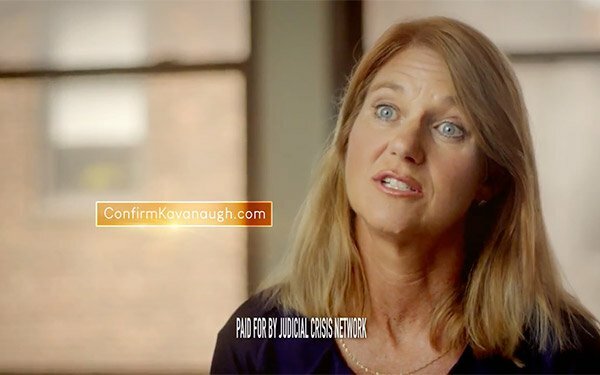 Political TV advertising ramped up this week, following Brett Kavanaugh’s Senate committee hearings on his nomination to the Supreme Court. They came after sexual-assault allegations surfaced against the nominee last weekend. Judicial Crisis Network -- a Republican-leaning political group supporting Kavanaugh’s nomination -- ran 26 TV commercials on Thursday; 28 on Wednesday; 17, Tuesday; and two on Monday, according to iSpot.tv. Another political advertiser, 45Committee, which touts the gains of Republican President Trump -- ran 10 spots on Thursday, 11 on Wednesday, 14 on Tuesday and five on Monday. For the past two weeks, the 45Committee, spent $619,671, while the Judicial Crisis Network spent $380,411. The biggest Democratic-leaning political advertiser, Tom Steyer, spent $68,707 during this period. Overall, $1.199 million was spent on national TV by political marketers during a two-week period, September 6-20. Major cable TV networks grabbed most of the national political messaging -- CNN had 82 airings of TV commercials; Fox News Channel, 68; Fox Business, 55; MSNBC, 53; and Viceland, 14. Over the last 30 days -- which include the Senate Judiciary Committee hearings on Kavanaugh -- $3.1 million was spent from all national political advertisers. Judicial Crisis Network ran 250 spots; the Democratic Congressional Campaign Committee, 117; 45Committee, 113; and Tom Steyer, 68. On September 16, The Washington Post reported that Christine Blasey Ford wrote a confidential letter to a senior Democratic lawmaker alleging Supreme Court nominee Brett Kavanaugh sexually assaulted her more than three decades ago. The following day, another Washington Post story said Judicial Crisis Network planned to spend $1.5 million in ads defending Kavanaugh’s character. An opposing political group, Demand Justice, said it would spend $700,000 on ads focused on the Blasey Ford accusation. 2 comments about "Political TV Ads Increase After Kavanaugh Assault Allegations". Douglas Ferguson from College of Charleston, September 21, 2018 at 11:26 a.m.
Not sure why the word allegation is made a plural. Rob Walters from Self replied, September 21, 2018 at 12:45 p.m.
so that it makes it look a lot worse than it (allegedly) was...she's losing credibility fast so the left supporters are sensionalizing, want you to believe there are more than just the one.